In our previous post we have told that Hootsuite Announced Premium Service, now today Slide share unveiled it’s premium service. Most of we know about SlideShare, a best and easy way to share our presentations with the world. Till now they have offered only free service, and now onwards you can get premium services. 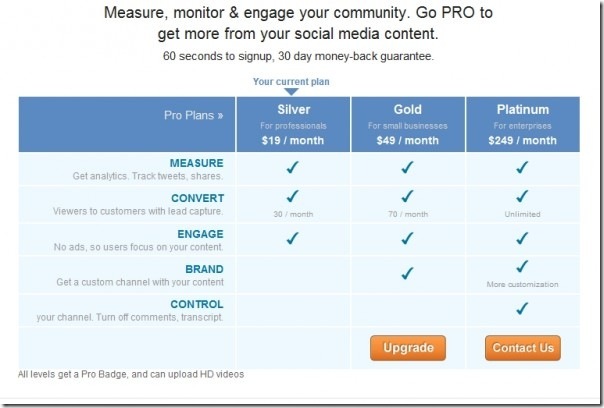 With launching premium service, a pro user can get extra benefit compared to the free users. Also, slideshare free users can get same benefit as you used earlier, but with pro accounts they get some new features. Here is the feature and price list of Slide share pro accounts. Some important points in official Announcement.. The new features let you do a lot more with SlideShare. Now you can track where your content is going, who is interested in it, and what is the buzz on Twitter or Facebook about it. The custom channel makes your SlideShare page an extension of your brand and website look and feel. Lead capture is included in all Pro packages meaning you can use SlideShare to capture leads onslideshare.net and anywhere your content is embedded. Some of these features are already accessible to SlideShare users for pay by usage. (e.g., Lead capture and channels). But in the past year, we heard from hundreds of users who liked the functionality but prefer to pay a monthly subscription fee. This came up again and again in conversations, emails and tweets. Finally, Platinum accounts are for large enterprises or organizations. You get everything at Gold level. Additionally, you get advanced customization of your channel, and you can control features (including turning off comments and transcripts, and adding widgets or from your own site to include blog posts, twitter streams, etc), This plan type scales with your vision. We thought a lot about how Pro accounts would fit into the SlideShare community. People who want to use SlideShare for free should continue without any changes. People who want advanced features can pay a monthly fee and get more. As a company, Pro accounts, allow us to keep building the overall community (like we already do) and also build innovative business features for Pro users. We have been running a private Beta for Pro accounts for the past 6 weeks. The results have been astounding. Not only have many people signed up for the Pro accounts at Silver and Gold, we have found a huge uptake for the Platinum Pro accounts ($249 / month) which have immediately struck a chord with enterprises. The good thing is, they are not completely neglecting free users, because it seems that they are providing earlier features now also.